Laptop Safes are among the most important dorm items you can bring with you to campus. Laptop theft is rampant on campus and dorm rooms are notorious for being too accessible to just about everyone. No one wants to be the one who always locks their dorm doors right? It makes it look like you are paranoid and don't trust your roommate or your friends friends. But if you want to protect the thousands of dollars of electronics you bring with you to college, including laptops, digital cameras, cell phones and more, you really need to find a way to make sure that your stuff is safe after you leave your room. Laptop safes are a must, as are laptop locks for when you are in the library or studying anywhere outside your dorm room. A laptop safe might seem unnecessary at first but when you have your laptop stolen, with all of your homework, term papers, projects and personal information in it's hard drive, you will wish you ignored those feelings. 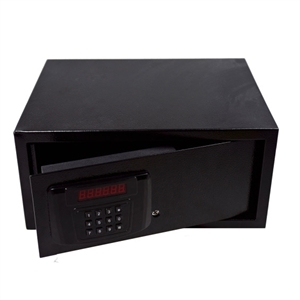 This dorm safe is exactly what you need to keep your laptop, iPod, digital camera, cell phone, passport and virtually everything else you need to protect and keep safe on campus. Our Dorm Safe Python Security Cable and Lock is preferred method of securing dorm safes to dorm furniture and bedframes.